If you think abseiling sounds like a dangerous sport, you’re only partly right. The reason for that is that it can be as dangerous or as safe as you want it to be, depending on the participant. Abseiling involves descending a vertical surface, using a rope, harness and rappelling system. Some adults abseil from great distances, up to 600 feet or more, and the risk is considerable. Children who abseil, however, start in a controlled environment like an indoor climbing centre, and abseil only from a relatively small height. While abseiling is not that difficult physically, it can be a huge mental challenge. Which is why for children, abseiling is a sport that can help build their confidence, skill levels and hand-eye coordination - and be a lot of fun! 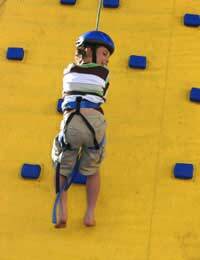 Rock abseiling is perhaps the most common type of abseiling for children. It usually involves making the most of a specially built climbing wall then abseiling down, although some centres offer natural rocks to climb, or even the sides of buildings! Your children will work with a qualified instructor to learn how to climb up and abseil down, so no previous training is required. They may, however, be able to move on to a higher level once they have mastered the basics - both literally and figuratively. Many places, however, do have a minimum age requirement, and some require that a paying adult is there at all times, so be sure and check first. Tree abseiling is another popular way to abseil – from the top of a tree. As the height is never that great, tree abseiling is a popular way for children to learn to abseil. Many rock climbing and abseiling centres throughout the country offer different types of abseiling, including tree abseiling. Just make sure that the centre involved is fully accredited and licensed before you begin, and that the instruction and safety equipment is up to scratch. Many people choose to abseil in a bid to raise money for charity – and have a great time while they’re at it. Both children and adults can take part in charity abseils, which offer many unique places to abseil from. Charity abseils have taken place from the tops of buildings, viaducts, watchtowers, trees, clock towers and purpose-built climbing rocks. Most people choose a place that has already been used an abseiling venue, although you can also choose your own structure – with the help of a professional abseiling company. Just pick a tower or wall, call the company and they will recce the site to see it if is suitable, after liaising with the owner and making all necessary recommendations. They will also provide the equipment needed on the day for a successful abseil. Don’t try this at home! Both children and adults who learn how to abseil say it has helped them conquer a fear of heights, build up general confidence, work on team-building techniques and just have an overall good time. For children in particular, abseiling is a sport that can help enhance their self-esteem, as well as encourage or foster their own belief in themselves. Best of all, they have fun while they’re at it. That can’t be all bad!